The Gourmetaly tour is amazaing. 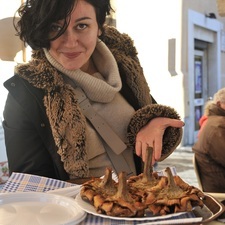 Daniela leads a small group through markets and restaurants to present a taste of Rome. At each stop Daniela introduces you to the restaurateur or shop keeper and provides a history of the food or wine you are tasting. This was our favorite tour of Rome. All reviews by Daniel C.
Daniel and Soraya are lovable guys! I have had great time with them taling about food and history of our families. Has been really hard to say goodbye at the end of the tour! I really hope to meet you again in the future guys and call me for any further info you'd need. Have a Gourmet-life! All reviews for Daniel C.